Known as the Land of Smiles, Thailand is full of tradition and adventure. Sawadee! Thailand is an intoxicating blend of the old and the new: ride an elephant through the forest, float down the Chao Phraya River that runs through Bangkok, or meditate in one of the country’s many golden temples. You may just as easily visit a modern mall in fast-paced Bangkok! Located in the heart of Southeast Asia, Thailand’s beaches are world-renowned, as is the gentleness of its people. Thai culture is heavily influenced by its neighbors, China and India. The rich variety of local food is very alluring, especially the tropical fruits, brightly colored herbs, and vegetables you've probably never seen before. Teaching in Thai schools is modern but still follows traditional Asian methodology: they stress rote learning (learning through memorization), wearing school uniforms, and having respect for authority. Trained to be generous, Thai students are expected to help out with duties and chores at school as well as at home. Extracurricular activities are part of the school program so that you can show off your interests and talents in activities such as Muay Thai (Thai boxing - a national sport that is very popular among teenagers), dancing, music, and International scouting. Experiencing Thailand firsthand will open your eyes to the multiculturalism of Southeast Asia and to a way of life that is as connected to the modern world as it is rooted in tradition. If this blend of culture sounds like a good fit for you, apply to study abroad in Thailand today! YFU Thailand will need a copy of your passport early on in the admissions process in order to begin preparing visa documents for you. If you do not have a passport at the time you submit your application, or you will be renewing your passport before you depart for Thailand, you will need to begin that process immediately upon applying with YFU. Tuition covers the cost of shool enrollment, but students should be prepared to pay for school supplies, school uniform, and any transportation costs to school. Gap Year Volunteer Program participants are also responsible for any transportation costs to their worksite. Program tuition does not include personal spending money. Thai schools can be quite large, sometimes with up to 2500 students and up to 50 students in a class. You will attend a local Thai school, where you will be placed in grade 10, 11, or 12 depending on the school. Required classes include Thai language, social studies, and physical education, but you'll work with your school counselor to select classes that will be best for you. As an exchange student, you will have many elective subjects to choose from such as English, history, Thai music, Thai dancing, Thai cooking, arts and crafts, artificial flower making, sword fighting, Muay Thai (Thai boxing), religion, meditation, and many others depending on the school. In English class, you will likely be considered a guest speaker and asked to assist the teacher. The school week is Monday through Friday and classes are typically around 50 minutes long held from 7:30 am to 4:30 pm with a daily morning assembly and some free periods throughout the week. Dress codes can be strict, with rules on hairstyles and jewelry. Thai students are also required to wear uniforms at school, so students may either have a uniform that is provided by their host family, or students will have to purchase them on their own, and the family will help to find the proper uniform for you. All students applying for the semester or year program must be available for a mandatory 3-day National Pre-Departure Orientation, which usually takes place in mid-July. This orientation is a required part of the program aimed at preparing students for their experience overseas. All students will participate in a one-day local pre-departure orientation in May or June. All orientation costs are included in program tuition. Once you arrive in Thailand, you will begin with a four day orientation in Bangkok. You will also participate in a three-to-four day mid-year orientation in October. You'll complete your stay with a re-entry orientation for four or five days in March. All orientation costs are included in program tuition. YFU students are encouraged to get involved in their communities by joining academic, sports, or recreational clubs that meet during and after school. In previous years, students have had the opportunity to participate in an excursion for the final five days of the program. Activities have included exploring the Northern region - traveling to Chiang Mai, "the Rose of the North," attending an elephant camp, and visiting a beautiful beach resort! Students on the gap year volunteer program must be at least 18 years old to attend and should demonstrate a high level of responsibility and motivation. As a volunteer in Thailand, you will either live with a local host family or in lodging that will be arranged by the work site that you will be volunteering with. These accommodations can include a dormitory, guesthouse or service apartments. In the first 3 months of your program, you'll work in a high school while taking a Thai language course. Volunteering: Possible options include teaching English, working with disabled children, serving in a hospital, and other types of community service for local residents at an NGO or working on a farm or in a hotel. You will be able to select within your application which types of community service you are most interested in, and then YFU Thailand will select a few potential worksites for you based on your skills and qualifications. After 3 months at your worksite, you can change to another to get a different experience if you'd like. Program Add On: Students who would like to participate in the volunteer program may also choose to add on an additional volunteer project to their program. 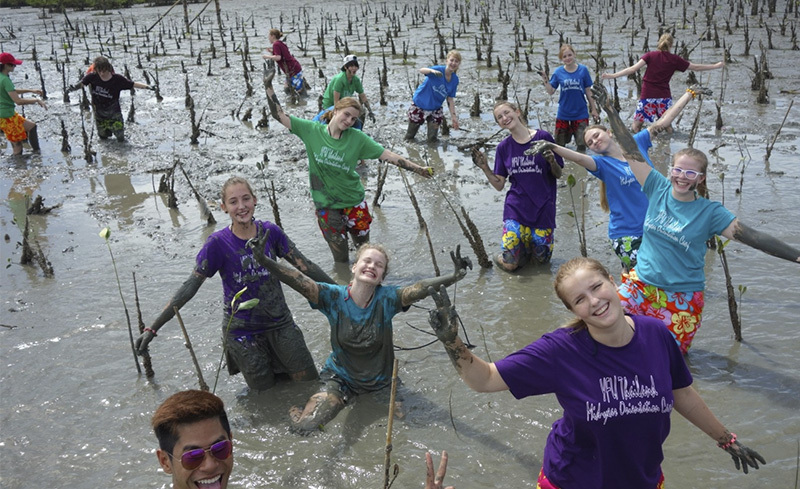 This project may be 2-4 weeks in length in October, where students may get to experience a different community within Thailand, and do volunteer work at a different site for this time period. 2019 Gap Year Volunteer Program: June 1, 1997 - May 31, 2001. 2019 Summer, Fall Semester & Academic Year Programs: July 1, 2001 - June 30, 2004. Students who do not meet this age requirement or will graduate from high school before the start of their program will be considered for admission on a case-by-case basis. Thai. Previous language study is not required. Students will receive an introduction to Thai language during their post-arrival orientation. Further language training is arranged by individual host schools. The Gap Year Volunteer Program includes a 30 hour Thai language course during the first 3 months. Placement can be in urban, suburban, small town, or rural environments. Students applying for the Gap Year Volunteer Program may be placed with either a host family or may stay at work site accommodations, such as a dormitory, guest house, service apartment or others that may be provided by the work site. This 6-week summer program allows you to totally immerse yourself into the Thai culture. You will live with a host family and have the opportunity to visit school with local Thai students. Students might also have the opportunity to experience a different community other than the community your host family lives in for about one week. 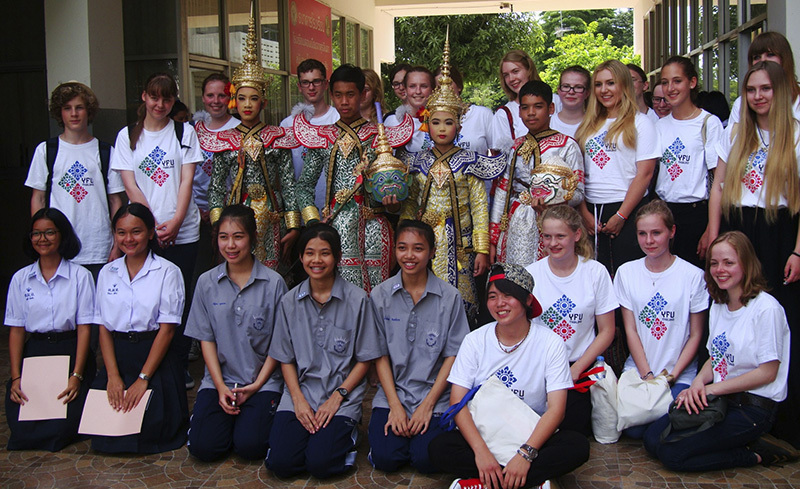 This will give students a chance to experience another culture within Thailand.